Lorraine Pratt Immen (1840-1927), a native of Michigan lived there as a lifelong resident. In 1865, she married Frederick Immen (1837-1909) an immigrant from Depstadt, Bavaria, Germany, a wealthy carpet dealer. They lived at 35 West Lafayette Street, Grand Rapids, Michigan and had two children Elmer (1862-) and Arthur B. (1867-). Their home was an elaborate mansion that served for many social gatherings and various women's clubs gathering in the great ballroom. She was a very active traveler, writer, collector of books, art, curiosities and coins, and was very involved in the arts and society. In 1887, she was the Founder of the Shakespeariana Club of Grand Rapids. She was also a member of the Michigan Historical Society, the Ladies Literary Club, and the vice-president of the Michigan Association of Elocutionists. Her collection of books, art, antiques, documents, photographs, correspondence, clippings, etc. are kept in the Grand Rapids Public Library. Her curiosity about a Fugio in her possession caused her to contact the Chapmans. 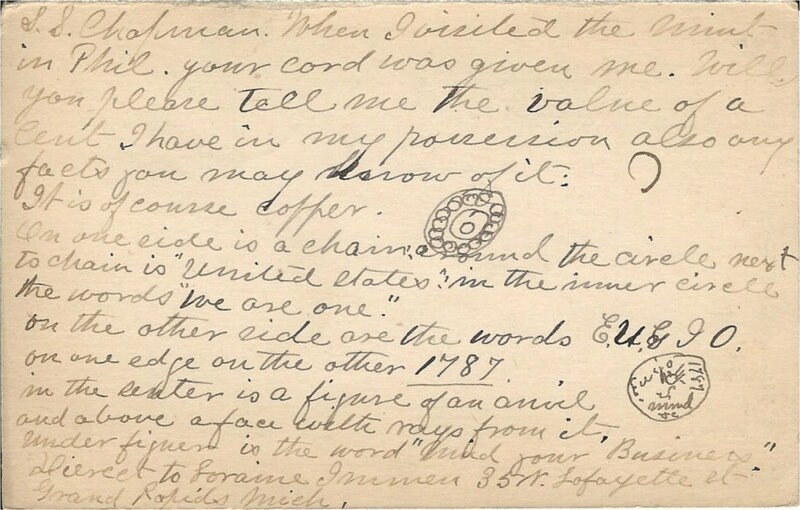 She obviously had no knowledge of American Colonial coins and so she wrote to Samuel Hudson and Henry Chapman with a very eager to learn mind. Her drawings of the Fugio are as amusing and entertaining as her descriptions and her letter. Fig. 1. Lorraine Immen's postal card to the Chapman Brothers postmarked Grand Rapids, Michigan, September 8, 12:30 P.M., 1894. Courtesy of the Lupia Numismatic Library, Special Collection, Chapman Family Archive. Her Fugio must have been worn somewhat (VG - F) since she could not identify the sundial but mistook it for an anvil. In 1895 she was a charter member of the Michigan State Federation of Women’s Clubs. In 1896 she published a booklet,California, giving details of her travels there and the impressions they gave, which were originally published as Letters of Travel in California that ran in the Grand Rapids Herald. Her picture appeared on the front page of the Grand Rapids Herald, Sunday, July 23, 1899. In 1900, she donated fifty books to the new library of the women’s building of the Michigan State Agricultural College. Her husband died April 9, 1909 at Washington, D.C., and is buried in Oakhill Cemetery, Grand Rapids, Michigan. She died October 20, 1927 and is buried at Oakhill Cemetery, Grand Rapids, Michigan.